← Good practice, best practice, or just practice? 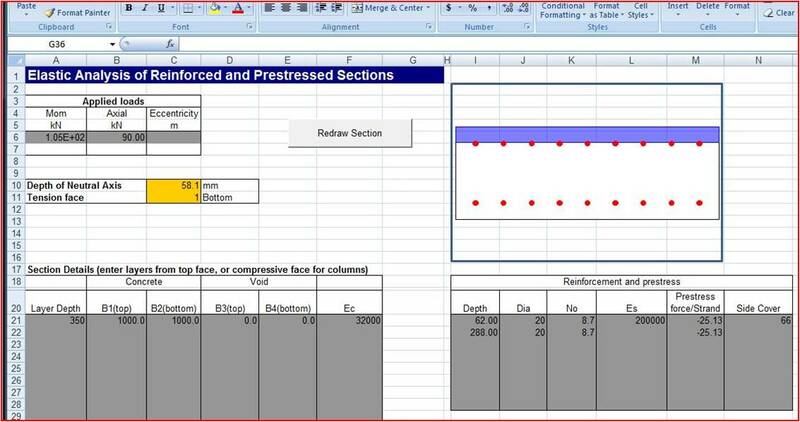 The previous post in this series provided Excel User Defined Functions (UDFs) to find the strain in a concrete section due to unrestrained creep and shrinkage. 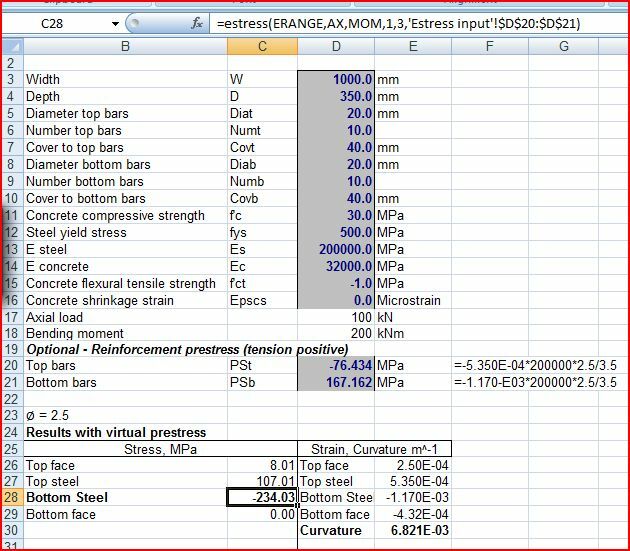 In this post the effect of restraint of the creep and shrinkage strains by the section reinforcing steel will be discussed, and in the following post a UDF will be presented that allows the stresses and strains in the section to be calculated allowing for creep and shrinkage strains and variation in the applied load and prestress over time. Both shrinkage and creep result in a shrinkage strain in the concrete, with no change in stress for an unrestrained section, but for a reinforced section the reinforcement partially restrains the concrete strain, resulting in a transfer of compressive stress from the concrete to the reinforcement for zones in compression, or an increase in the tensile stress in the concrete for uncracked zones in tension. For an uncracked section with symmetrical reinforcement the shrinkage strain does not affect the curvature of the section. For a cracked section there is a significant change in curvature due to shrinkage strains, even for symmetrical reinforcement. The restraint of the shrinkage strain causes a significant increase in the tensile stress in the concrete, which results in a reduction of the cracking moment. 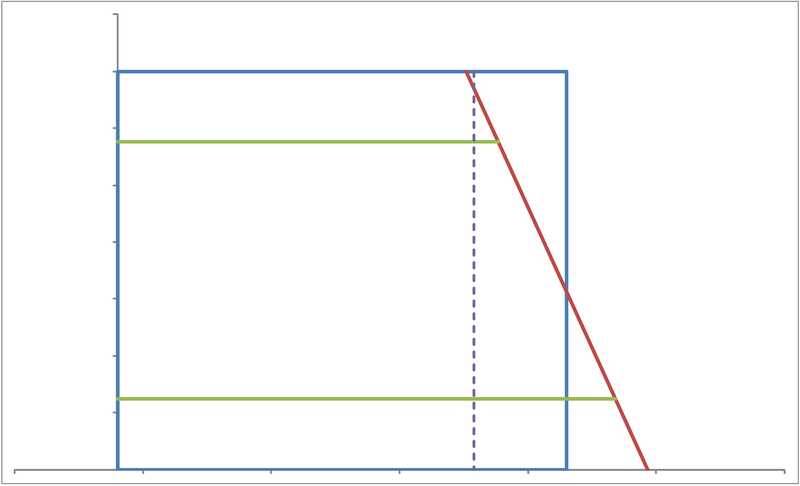 The effect of shrinkage may be analysed by applying a compressive prestress to the reinforcement, equal to the free concrete strain multiplied by the reinforcement elastic modulus. The change in stress in the concrete due to shrinkage is reduced by the effects of creep. Analysis of this effect is discussed below. Creep is the increase over time of strain due to applied load. Creep typically increases the strain in the concrete by a factor of the order of 3, and must therefore be considered in assessment of the long term behaviour of concrete structures. The reinforcing steel is also subject to creep strains, but at typical reinforcement stresses the effects are negligible (except for prestressed reinforcement, where the relaxation of prestress due to creep must be considered). Since shrinkage results in a change of stress in the concrete, this interacts with creep effects. The effect of creep strains could in principle be analysed in the same way as shrinkage, by the application of a virtual prestress to the reinforcement, but since the magnitude of the creep strain is proportional to the stress in the concrete, the magnitude of the virtual prestress is dependent on the stress in the concrete after completion of creep, so an iterative procedure would be required to find the correct level of prestress. 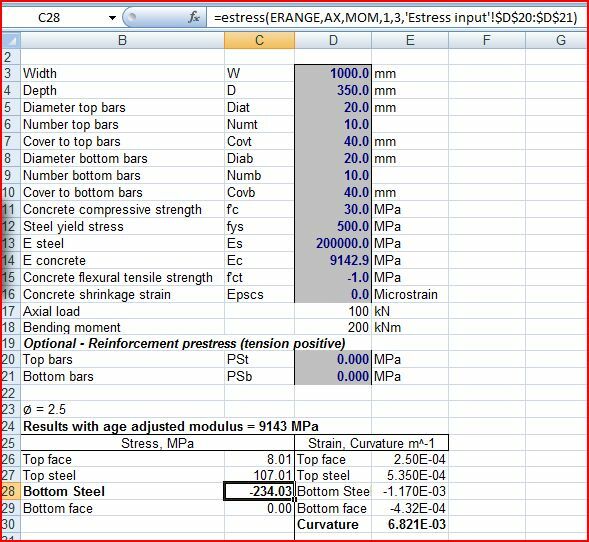 A simpler approach is to use an “age adjusted modulus” for the concrete, so that the analysed strain in the concrete includes both elastic and creep strains. For a creep coefficient of Ø the age adjusted modulus is given by Et / (1+ Ø), where Et is the elastic modulus of the concrete at the time of loading. It does not take account of the variation of creep stresses over time. It does not take account of the interaction between shrinkage stresses and creep strains. If shrinkage results in the section transitioning from an uncracked to a cracked state at some time after initial loading, the initial stress and strain conditions will be very different to those assumed, and this may introduce significant inaccuracies. If the loading and/or prestress applied to the section changes significantly over time it is not possible to take account of these changes in the simple analysis. 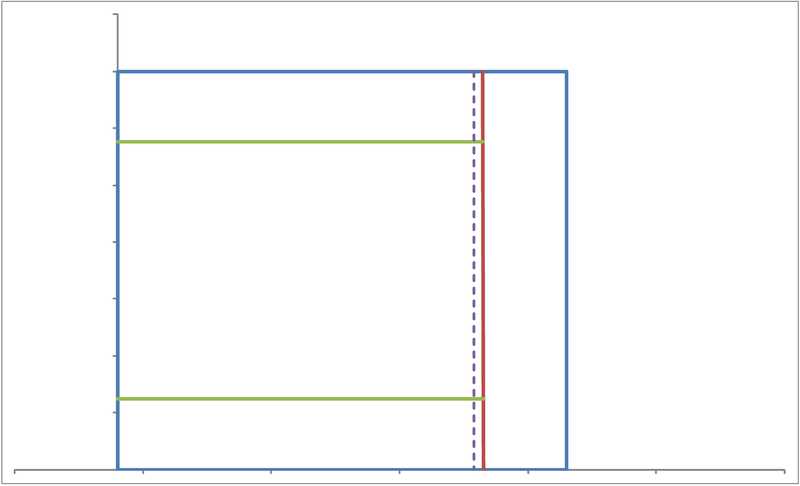 Set up a table of logarithmic time steps, with shrinkage strain and creep factor for each time step. Optionally add changes to applied loads, and changes to prestress loads. Analyse the strains and stresses in the section at the end of the first time step, using the virtual prestress method for shrinkage and the age adjusted modulus method for creep. 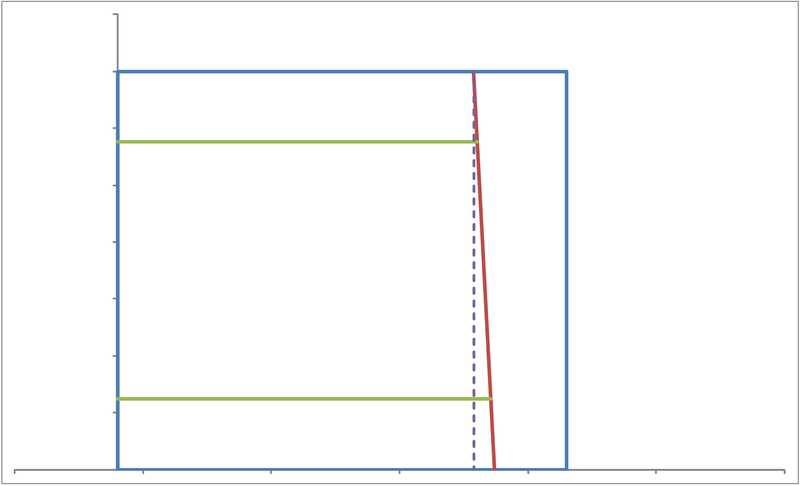 For each succeeding time step add creep strains from the previous stages to the cumulative shrinkage strain for calculation of the virtual prestress. 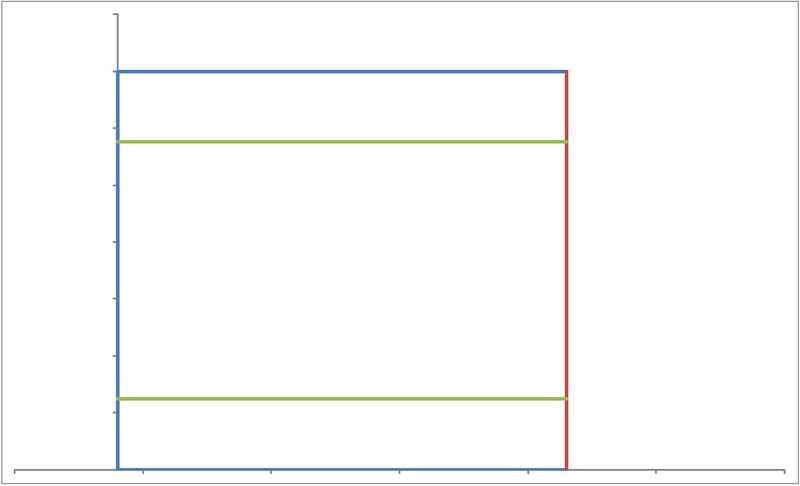 Find the creep strain increment using the age adjusted modulus, using the increment in the Ø value, and adjust applied loads and applied prestress where applicable. A spreadsheet performing this analysis, with examples based on real projects, will be included in the next post in this series. This entry was posted in Concrete, Newton and tagged AS 3600, Concrete, creep, Eurocode 2, shrinkage. Bookmark the permalink. Toaria – I don’t have any plans to transfer any of this to Fortran in the forseeable future, but the functions work reasonably quickly in VBA!